Now there are many reasons why the paper-taped-to-wood option was not a good way to go about this, but I won't go into too much detail. I'll just say that you should look into using card instead of paper, and drawing an outline around it onto the wood, instead of sticking anything to it. Now... you see that great big knot to the left of the photo? Thats' the sort of blemish I was happy to remove. 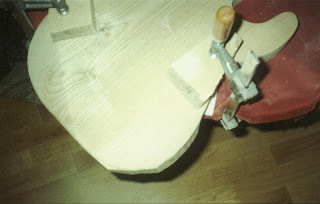 My advice here is not to cut too close to the outline, as the jigsaw tends to not cut exactly downwards. This means it could cut closer at the bottom than at the top. Also, erm... I know it should go without saying, but remember to move your block of wood from time to time, so that you don't cut into your table/workbench. great job! By any chance did u make sthg for a Gibson SG ? In answer to Micose, no, this is the only one I did. The body of the SG would be interesting to do though, though doing the neck would scare me a bit, unless I could make one with a bolt-on neck. Anonymous, usually what happens is that you have a thick laminate of something like quilted maple glued onto the top surface of the guitar. 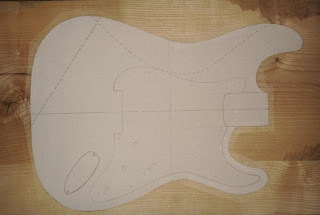 Then from there, you sculpt it, in a not disimilar way to how the strat was sculpted. What you have to be careful about is that the laminate is thick enough that even after sculpting, you have not gone right through it. It would definitely be a tough challenge doing one of these DIY.